Tag line: "Can a woman's beauty be changed to a thing of terror?" The year is 1946, and some American G.I.’s, only days before they head home, are touring a marketplace in Asia. While there, the six buddies: Tom (Marshall Thompson); Paul (Richard Long); Carl (Jack Kelly); Pete (William Reynolds); Rico (David Janssen); and Nick (James Dobson), encounter a snake charmer named Daru (Leonard Strong), who promises to sneak them into a religious ceremony no westerner has ever seen before, where a woman will supposedly transform herself into a cobra! Shortly after the ceremony begins, Nick snaps a picture, inadvertently exposing the fact that foreigners are attending this sacred event. As the pals fight their way out, the High Priest (John Halloran) puts a curse on them, promising the Snake Goddess will take her revenge by killing each of the intruders, one at a time. Sure enough, Nick dies the next morning, the victim of a snake bite. The remaining five head back to the States, returning to civilian life and forgetting all about the curse. That is, until Tom begins dating Lisa (Faith Domergue), who only recently moved to the U.S. All at once, the ex-G.I’s start dying under mysterious circumstances, and only Paul suspects the elusive Lisa might have something to do with it. 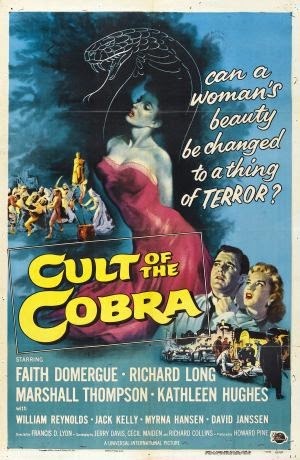 Released in 1955, Cult of the Cobra gets off to a good start, with its best scene being the religious ceremony, during which a woman, decked out in scales and moving like a snake, slithers out of a basket and attacks one of the faithful. It’s at this point Nick makes the fatal error of trying to take a picture (despite the warning Daru gave them earlier that cameras were not allowed). Their escape from the temple is also well handled, and the mystery surrounding Nick’s death keeps things interesting for a while (he was originally bitten right after the ceremony, and Tom saved his life by sucking the poison from the wound. Later that night, as an injured yet fully alert Nick lies in a hospital bed, he’s again bitten by a snake that crawled through the window, this time finishing the job). I even liked how the attacks were shown from the snake’s point of view, and Faith Domergue reminded me of Simone Simon in 1942’s Cat People, playing Lisa as a somewhat vulnerable woman who may or may not be hiding a terrible secret. Unfortunately, Cult of the Cobra begins to lose steam at its halfway point, spending more time on the romantic entanglement that develops between Lisa and Tom than was necessary. Another issue is the attacks themselves, which become less effective as the film progresses (we never actually see a snake in any of them). Things pick up again in the final moments, but between its promising start and tense finale are about 40-45 minutes that bog the story down. While not a bad movie, Cult of the Cobra isn't all that it could have been.